Tankless water heaters are becoming a progressively more popular alternative to traditional tank-style water heaters. According to Research and Markets, the global tankless water heater market is expected to grow at a compound annual growth rate of around 7% between 2018 and 2022. This is no surprise, as this style of water heater is increasingly attractive to homeowners. Not only are they more energy efficient than their tank-style counterparts, but they also have a longer lifespan, some upwards of 20 years, and many components can be field replaced. Additionally, they offer space-saving benefits and a reduced risk of damages caused by a malfunction, since they are not storing 20-50 gallons of water in the home. Tankless water heaters function significantly different from the style most adjusters have become familiar with and, therefore, suffer different losses and require different solutions to return the insured to pre-loss condition. Additionally, the cost associated with replacing a tankless water heater is much higher than a tank-style one, making it critical for property adjusters to thoroughly assess this equipment before simply settling to replace it. This article outlines how tankless water heaters function (and why they fail) to ensure adjusters are equipped to settle these claims accurately. 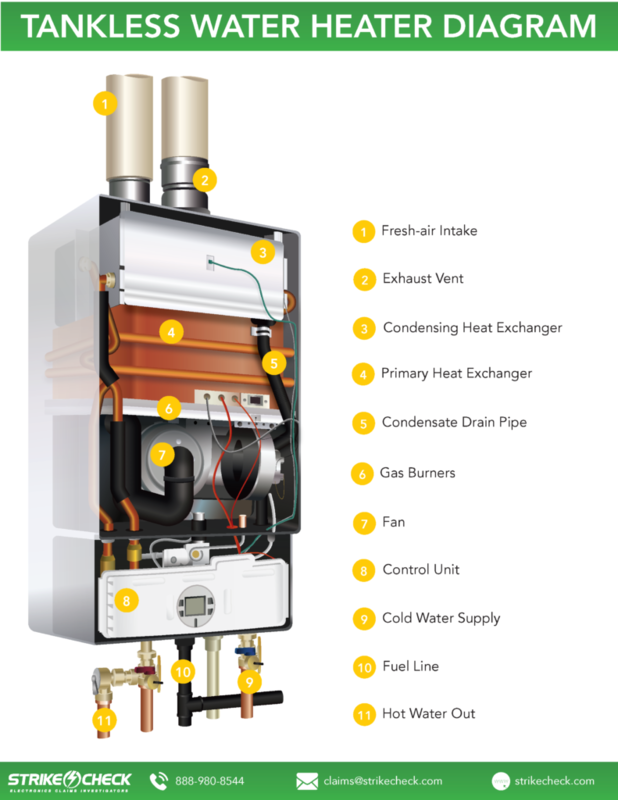 Tankless water heaters provide heated water on demand without the use of a storage tank. This is accomplished through the use of a heat exchanger and either a gas burner or an electric heating element. When a tap or an appliance calls for warm water, the cold water travels through the inlet pipe into the tankless water heater. The electric element or gas burner heats the heat exchanger. The water then flows through the heat exchanger, absorbing the heat without the toxic exhaust. The exhaust fumes are then vented safely out of the home, and the heated water travels to the appliance or fixture. Unlike their tank counterparts, tankless water heaters are not sized based on capacity; they are instead rated by the maximum temperature rise at a given flow rate. This indicates how much hot water can be produced at a point in time. The flow rate required is determined by totaling the flow rates of each hot water device that will be used simultaneously. The maximum temperature rise is simply the difference between the temperature of the incoming water supply and the temperature to which the water needs to be heated. This calculation will determine the maximum temperature rise at a given flow rate that is required for the water heater to adequately provide heated water. There are significant differentiating factors among tankless water heaters. The first consideration is the use of the water heater. There are point-of-use and whole-home styles. The point-of-use water heater is installed at a specific appliance or use point. These units are smaller and only have the ability to produce heated water for one fixture at a time. Whole-home water heaters are larger and have the ability to provide hot water for multiple points of use throughout the home simultaneously. The second factor is a condensing vs. non-condensing water heater. The condensing variety is a newer technology. This type of water heater has a second heat exchanger (shown below with the label, condensing heat exchanger), which cools the exhaust gases before venting them out of the unit. This captures the residual heat from the exhaust gases and uses it to help heat the water, making the unit more efficient. Additionally, because the exhaust gases are cooler, cheaper ventilation materials (such as PVC) can be used since the vented gasses will be noncorrosive. Non-condensing units, on the other hand, do not include a secondary heat exchanger. These water heaters vent the gases outside immediately, at higher temperatures. This requires a noncorrosive (typically a steel alloy) flue to be used for ventilation, which are more expensive. They are also less efficient than the condensing variety because the residual heat of the exhaust gases is wasted. Tankless water heaters may have an average lifespan of 20+ years, but that is achieved only if they are properly maintained. 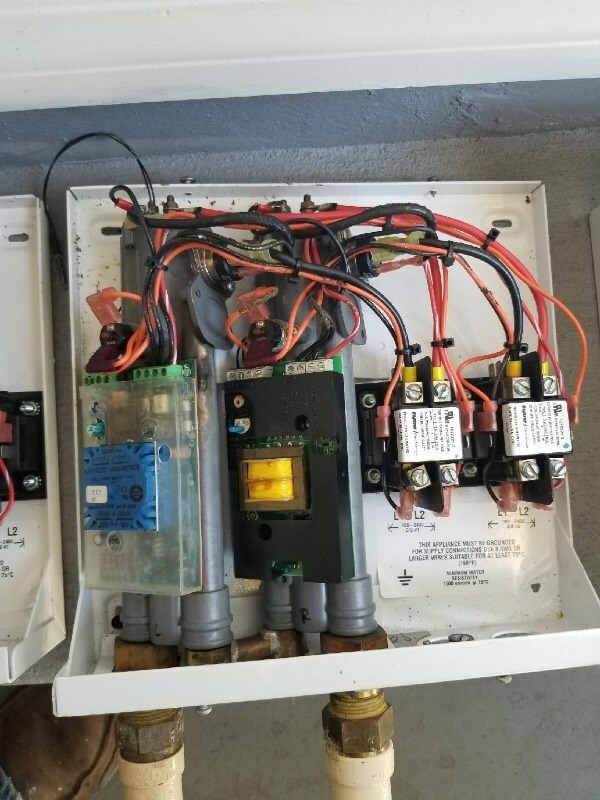 One of the most frequent losses that plague tankless water heaters is corrosion caused by a lack of routine descaling. How frequently the water heater requires descaling depends on the hardness of the water. Without this routine maintenance, mineral deposits can accumulate in the unit and damage the internal components. Additionally, the electrical components are often the subject of damage from voltage surges. The delicate connections of the circuit boards, as seen below, can be subject to overvoltage that can lead to damage or outright failure. In conclusion, as tankless water heaters continue to rise in popularity, adjusters should take the time to familiarize themselves with this type of equipment to handle these claims accurately. If you have a claim involving a tankless water heater and need to determine the cause of loss and repair options to return the insured to pre-loss condition, you can submit a new claim to StrikeCheck here.